Hole Size and Pen Size in Spirograph: What difference does it make? 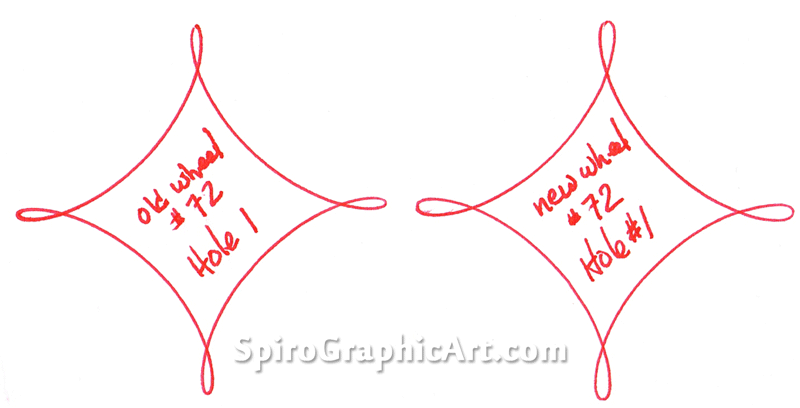 Home→Spirograph→Hole Size and Pen Size – What Difference Does It Make? Hole Size and Pen Size – What Difference Does It Make? As I discussed in my in-depth review of the new Spirograph Deluxe Set compared to my old Super Spirograph, the holes in the new wheels are larger than in the old ones, in order to accommodate more pens. What difference does a larger hole make in the designs you draw? To find out, I made some designs with the old Super Spirograph set and the new Spirograph Deluxe set, using the same pen, a red uni-ball Vision fine point. This ballpoint pen is not particularly thin at the tip, but we can still observe the pattern of differences. Ring 144/96, wheel 72, hole 1. Left: old set. Right: new set with larger holes. Same pen: a uni-ball Vision fine point. You’ll notice that the old wheel on the left, with the smaller hole, produces smaller loops. At right, the new wheel’s larger hole allows the pen to move around the hole more as the wheel goes round. The design is just as regular, but the loops are bigger. In the above pair with wheel 56, the loops made with the old wheel (left) are again smaller. We really see the consequence in the center of the pattern. The smaller loops have made for a more open centre. Taking the same wheel 56, let’s see what it does in a more elaborate design. Ring 144/96, wheel 56, holes 1, 3, 5 & 7. Old set left, new set right. The differences in the overall pattern are slight. The overall geometry, a 12-pointed star, is the same. There is some variation in where the lines cross. In the pattern at left, the central point has been closed in while on the right the weave is a little more open. Spotting the differences between the two is a bit like another old childhood game, often found in magazines, in which the artist has deliberately drawn different details in two different pictures. What do you see? Here are some more examples. What do you conclude? Ring 144/96, wheel 52, holes 1 and 2 (or 3?) Old Spirograph on left, new Spirograph with larger holes on right. Ring 144/96, wheel 80. Holes 1, 2, 3 etc., moving one tooth right for each pattern. I am from the old school of when this wonderful invention first started. Now I am 50 and am in need of some new designs and what better place to look is back in time to Spirograph. What I need is a site that shows what design each and every hole actually makes. I thought there used to be a book in with the set that told you this info . I do not see any booklet like that, so I was wondering is there a place on the net? Thanks for any help! If you still have the original box, look on the inside of the lid. It shows the pattern of every wheel for both rings (hole #1). The new set has the same diagrams in the booklet that comes with it. My old Super Spirograph is minus its lid, which may have had those drawings; they aren’t in its booklet. I’ve just made a table showing the number of points (http://spirographicart.com/table-spirograph-points/), but it includes numbers of wheels that aren’t in a Spirograph set. I’ll do a simpler chart with just Spirograph (one day soon). It’s comments like this that tell me about things I should put on this site. So thanks for the feedback. I’ll put it on my to-do list to reproduce the pattern guide for all the wheels. When I was reading your review that compared the new Spirograph Deluxe Set with your old set, and again as I was looking at your examples on this post, it occurred to me that the size of the pen nib needs to match the size of the holes in the wheels as closely as possible. If the tip of the pen is much smaller then you will get the problem you’ve encountered, where the extra freedom of movement that the pen has in the larger holes of the newer sets results in “sloppier” designs”. How do the tips of the pens that come with the new sets compare to the holes in the wheels? Do the designs made using those pens suffer from the same problem?